The day began foggy and cool, but cleared somewhat as the morning wore on, warming up considerably and stayed humid and hazy, which made hiking sweaty and tiresome. 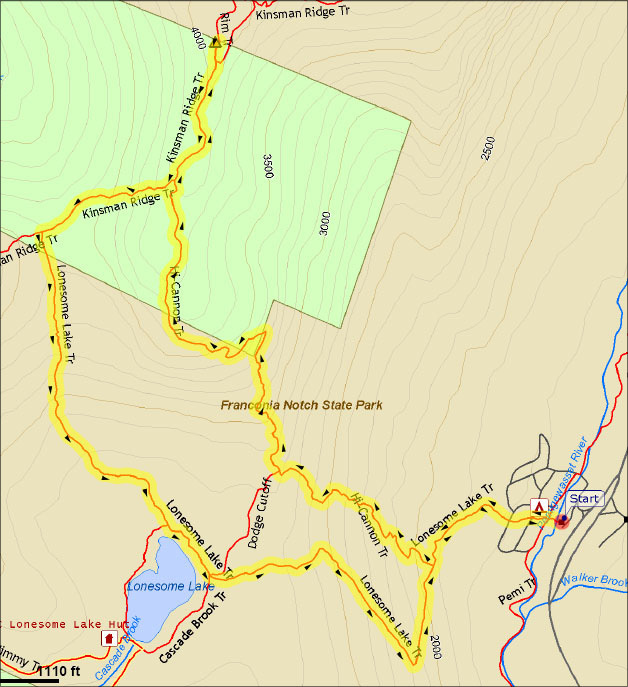 We parked the car at Lafayette Place by and started up Lonesome Lake Trail around 9 AM. We soon turned onto the Hi-Cannon Trail , which climbed steeply up the mountain via numerous short switchbacks. We didn’t see any other hikers until after the Dodge Cutoff junction. Further up, we took some photos of Franconia Ridge from the ledges. We climbed a ladder up a steep ledge but couldn’t find Cliff House, which is supposed to be a natural rock shelter. We may have failed to recognize it from its description in the guidebook. Above the ladder, we took more photos of views to Lonesome Lake, including one of Erin looking down at the lake. A short distance above the ladder, we met a two mothers hiking with their kids. They were a bit slower than us, but seemed to be having a good time. They stopped for a rest and snack while we went on. 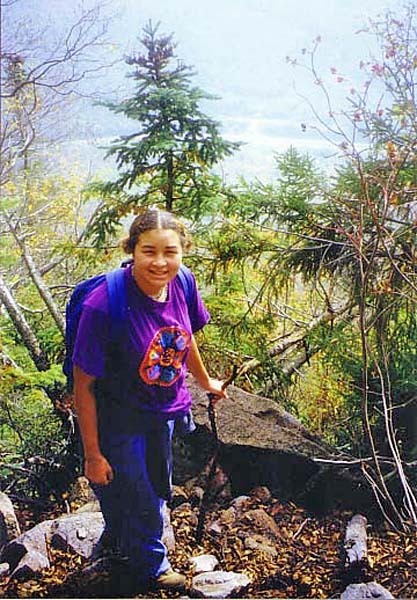 Finally, we reached the Kinsman Ridge Trail and made it to the summit tower just after noon. There were a lot of tourists on the summit who had taken the tramway up. It felt strange mingling with them. We ate lunch and rested in the tramway building, then started down around 1:15. We decided to take a different route down, so we took the very steep and sometimes poorly-marked Kinsman Ridge Trail over huge boulders down to Coppermine Col. We weren't even sure whether we were still on the trail or not until we met someone on his way up. We turned left onto the Lonesome Lake Trail just before the Kinsman Ridge Trail began climbing up the closest Cannonball. Although short, the section of the Kinsman Ridge Trail we climbed down was so steep and slippery, I wouldn’t take it to go down again; it would be a lot safer going up. The Lonesome Lake Trail had new timber puncheons in the boggy area northwest of the lake. After a quick trip down, we got back to the car around 2:30 and then headed home. At the time, I thought we had been particularly slow, but looking back on it, we actually made pretty good time on this route, especially considering how hot of a day it was. Me at the junction of the Lonesome Lake and Hi-Cannon Trails. 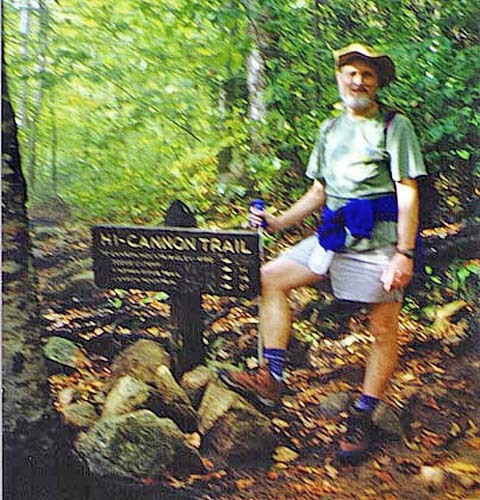 The Hi-Cannon Trail climbs steeply up the southeast face of Cannon Mtn. Erin on the Hi-Cannon Trail on one of its numerous short switchbacks. Me climbing up the ladder on the Hi-Cannon Trail. 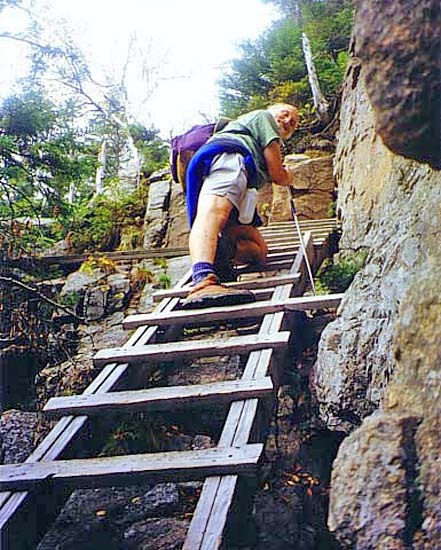 The ladder is about halfway between the Dodge Cutoff junction and the summit. 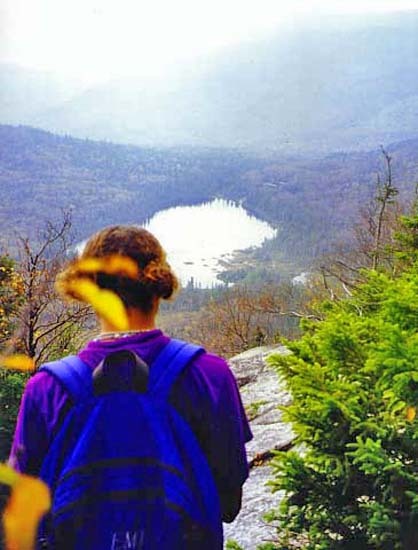 Erin looking at Lonesome Lake from the Hi-Cannon Trail. The hazy shape in the background is the ridge leading to North Kinsman Mtn. 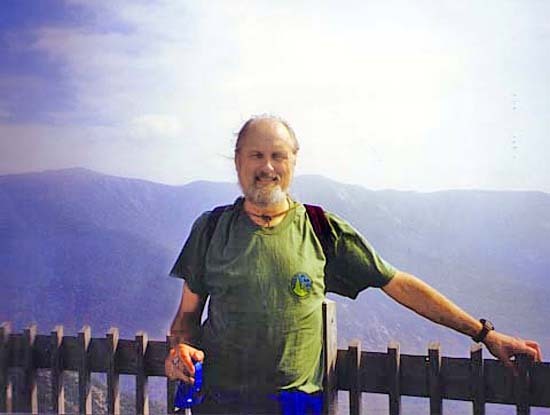 Me on observation platform at the summit of Cannon Mtn. The ski area operates its tramway to summit in the summer, so there are always a lot of tourists milling about up there.